Today Warner Bros. Interactive Entertainment and Turbine announced a new digital expansion Riders of Rohan that will be launched in Fall 2012. The expansion will increase the level cap, add a new Mounted Combat system, as well as welcome players into the vast plains of Rohan including iconic locations such as Amon Hen and Fangorn Forest, and much more. Warner Bros. Interactive Entertainment unveiled today The Lord of the Rings Online™: Riders of Rohan™, the latest expansion to the award-winning free-to-play massively multiplayer online roleplaying game (MMORPG) developed by Turbine. Riders of Rohan expands the online world of Middle-earth where players join forces to ride into the Plains of Rohan. Riders of Rohan launches in the Fall of 2012 with an increased level cap, the vast plains of Rohan including iconic locations such as Amon Hen and Fangorn Forest, the new Mounted Combat system and much more! Today, Turbine has released the latest screenshots for The Lord of the Rings Online (LOTRO) Update 5: Armies of Isengard! The Update, released last week, is the first major update to the game since the launch of the record-breaking Rise of Isengard expansion pack, and brings five new Isengard instances to the game, along with a continuation of the Epic story and a new Instance Finder. Face the Terrible Armies of Orthanc and Defend the Kingdom of Rohan in the Final Update of 2011! The Epic Story continues! Aid Prince Théodred as he endeavors to keep the forces of Saruman from entering his homeland, the Kingdom of Rohan. Report to Théodred’s camp and help prepare his troops for the trials to come against the armies of Isengard. The Ford of Isen, the gateway to Rohan, must be held at any cost! Now you can quickly jump into new Rise of Isengard instance content with old friends or meet new ones through the LOTRO Instance Finder! You will also earn additional rewards as you complete randomly-selected instances and skirmishes through the Instance Finder. Begin the assault on Saruman’s stronghold through five new instances culminating in a confrontation with Saruman himself! Enlist as part of a covert mission to sabotage the inner workings of the Isengard war machine. Cause widespread destruction by turning a wild troll against its would-be masters and uncover clues about Saruman’s nefarious plan taking shape within the shadows of Orthanc! Scout out and disrupt one of Saruman’s lumber operations on the outskirts of Fangorn forest. Eliminate Uruk foresters and guards and contend with their violent overseer but beware for when Fangorn forest is involved not everything is as it seems! Descend into a forgotten laboratory in the caverns beneath Orthanc where twisted experiments still roam. Face terrible abominations, discarded as Saruman endeavored to perfect the monstrous Uruks. Make haste as you delve deeper into the pits and discover the truth about Saruman’s plans! Powerful and mysterious weapons have been appearing in the hands of soldiers under Saruman’s command. Infiltrate the Foundry, the sprawling subterranean heart of Saruman’s war effort, and disrupt the supply of the dangerous weapons to deal a fateful blow to Isengard! Saruman of Many Colours has been laboring for far too long within Isengard, unimpeded and unseen. What terrible plan has he set in motion? Swing wide the gates of Orthanc and enter the dangerous and shadowy tower to confront the powerful traitor himself. Gather together your eleven most powerful allies and steel your resolve for, should you fail, all hope may be lost! Today, Turbine has announced that the next upcoming content update for The Lord of the Rings Online (LOTRO), Update 5: The Prince of Rohan will launch on December 12. The Update continues the epic story and adds 5 new Isengard instances to the game! Turbine has also released new screens depicting "The Foundry" instance. The Lord of the Rings Online: Mithril Edition can be pre-ordered on gamestop.com for $29.99, with release date February 21st, 2012. If you pre-order Lord of the Rings Online Mithril Edition you will get 500 bonus Turbine Points! 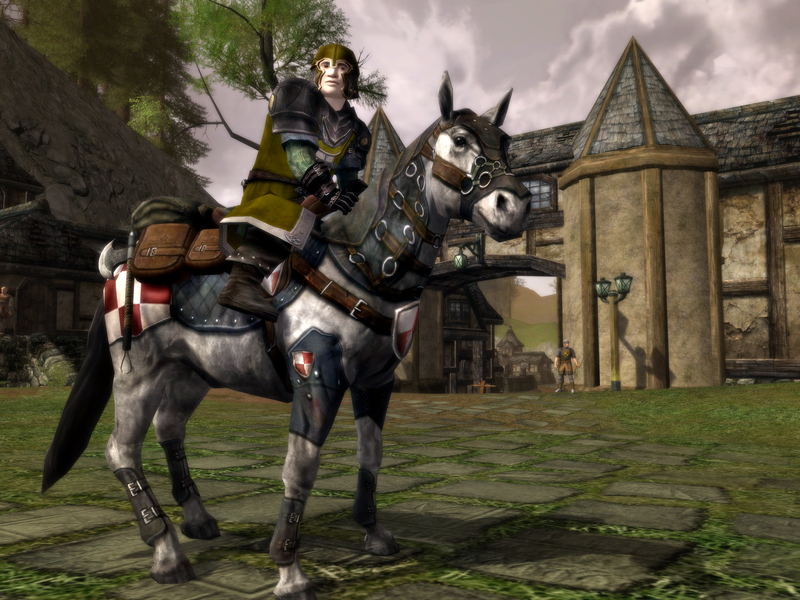 Travel Middle-earth in style with this exclusive in-game mount! Saddle up as early as level 5 and be on your way to adventure much faster than on foot! Forge your own legend in Middle-earth alongside Aragorn, Legolas, and Gandalf. From the Shire to Rivendell - adventure in a masterful recreation of Middle-earth! Includes the Trollshaws, Eregion, Mines of Moria, and Lothlórien. 2,000 Turbine Points - Customize your LOTRO experience with 2,000 points to spend in Middle-earth! Buy cosmetic gear, rare mounts, experience boosts, buffs and more. If you are not willing to wait you can select the "1" size option. If Instance Finder can't find a group for you, you'll be put into a random solo encounter fitting your selection criteria. Turbine is offering a new Lotro Store exclusive: Steed of the Guardian, for limited time (November 23rd until December 8th, 2011). A Guardian's steed must be strong and stout to bear the weight of its master's heavy armour and arms. This sturdy mount has an attractive steel gray coat with a black tail and its rugged tack is well designed to carry weapons, shields, and provisions for a long journey to war and danger. This steed has 250 health and allows you to travel 68% faster than running on foot, making it faster and stronger than many other mounts! Not fast enough for you? Try a Mount Speed Boost! • A LOTRO Store Exclusive! Click here to see more LOTRO Store Exclusive Steeds! • Click here to see many more Steeds Of Middle-earth! • Click here to see a close-up of this steed! Ten Ton Hammer has an interview with Adam Mersky, Executive Director of Communications for Turbine, and Aaron Campbell, Senior Producer for LotRO, concerning Update 5. Lotro Update 5 is scheduled for December and open beta testing will begin on Bullroarer on Tuesday. A brand-new interface that's coming out with Update 5 is the Instance Finder. It will allow players to queue up for instances, either individually or with a group. Everyone who's opted in for that, everyone who's looking for a space right then, in your level band, et cetera, in the right roles, it will automatically match you and send you into the space. Essentially, this is a fellowship finder that doesn't require the use of chat channels. Update 5 also brings three 3-person instances, a 6-person and a 12-person raid, and the continuation of the epic book. Head to Ten Ton Hammer website for more information.